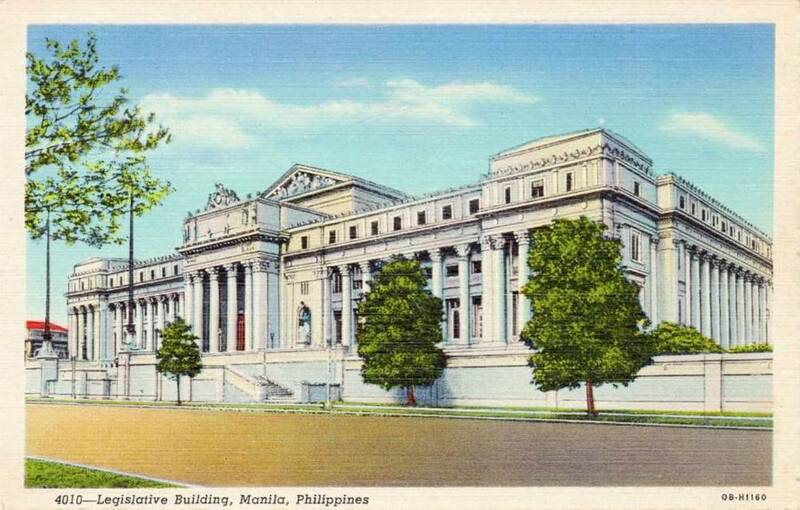 The Old Legislative Building, in my honest opinion, is no doubt one of Manila's most elegant, most beautiful American Colonial buildings ever to have been built on Philippine soil. 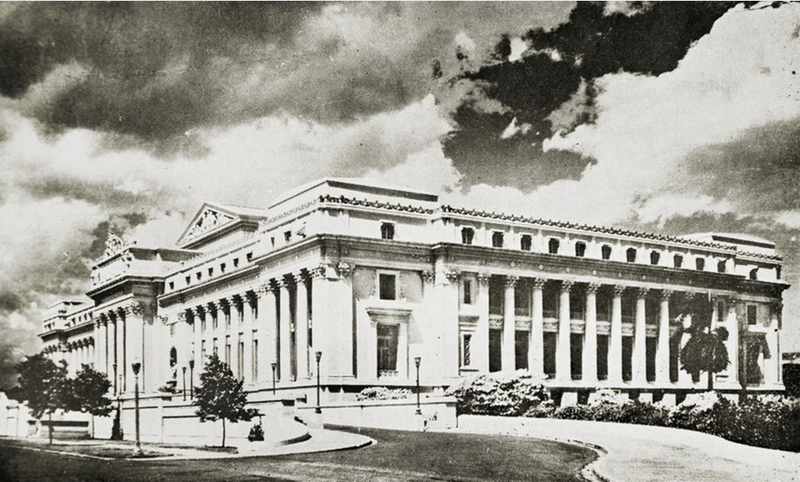 Truly an architectural gem, it is "a masterpiece of neoclassicism in civic architecture." 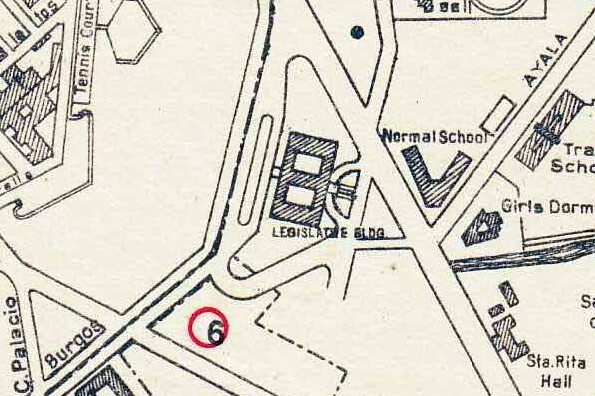 1934 map showing the building's location along Calle Padre Burgos and Taft Ave. 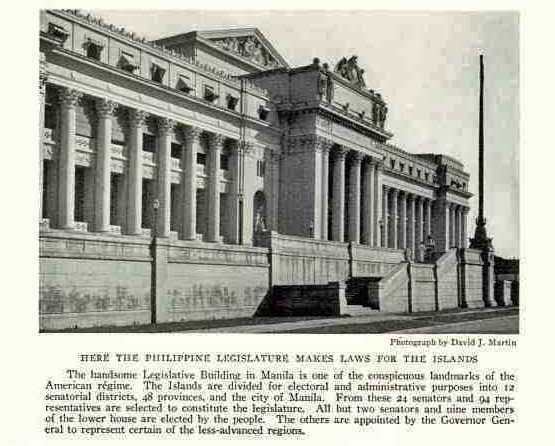 The Legislative Building stood out and was truly an imposing structure. 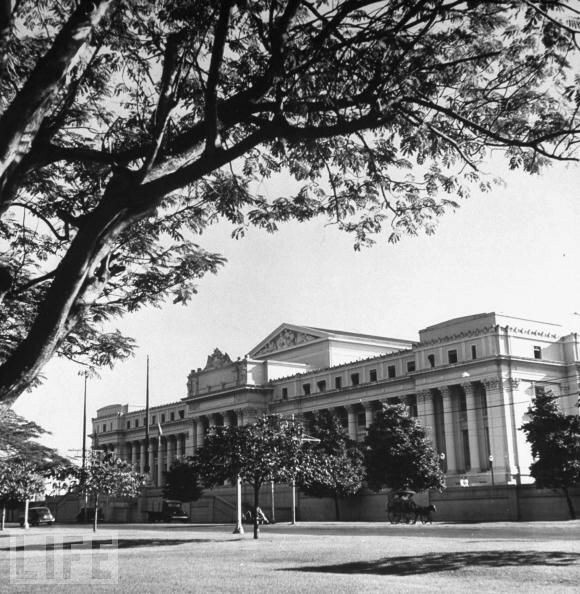 Presently known as the National Art Gallery of the National Museum of the Philippines, this imposing and stately structure along P. Burgos Drive and Taft Avenue in Manila has been through a lot since it's completion. Designed by Arch. Ralph Harrington Doane and his Filipino assistant Antonio Toledo, it was originally meant to be the National Library under the original plans of Arch. Burnham for Manila. 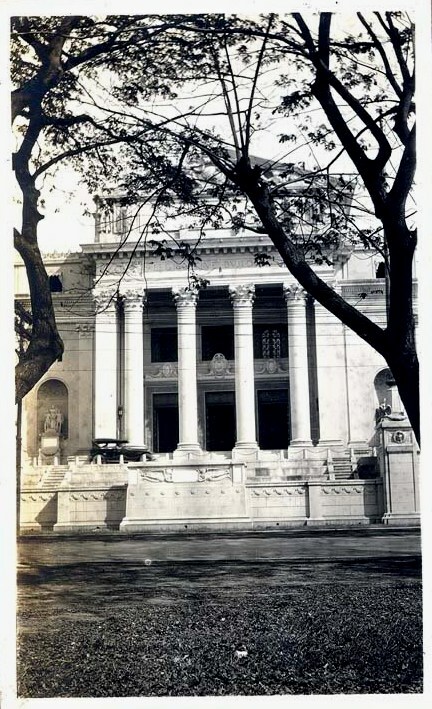 1935 photo showing the full columns on the front and on the sides. 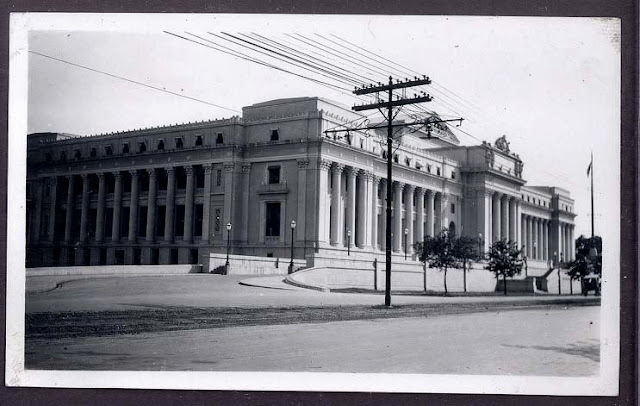 Construction of the building began in 1918 and was delayed several times because of money issues. When the legislature decided to occupy the building, renowned Arch. Juan Arellano took charge of the revisions of the plans. 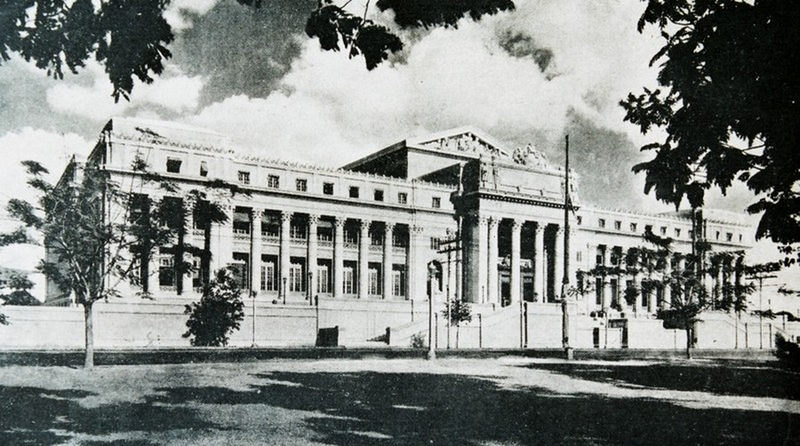 The original pre-war structure occupied a ground area of 6,000 square meters and a total floor area of 2.5 hectares. 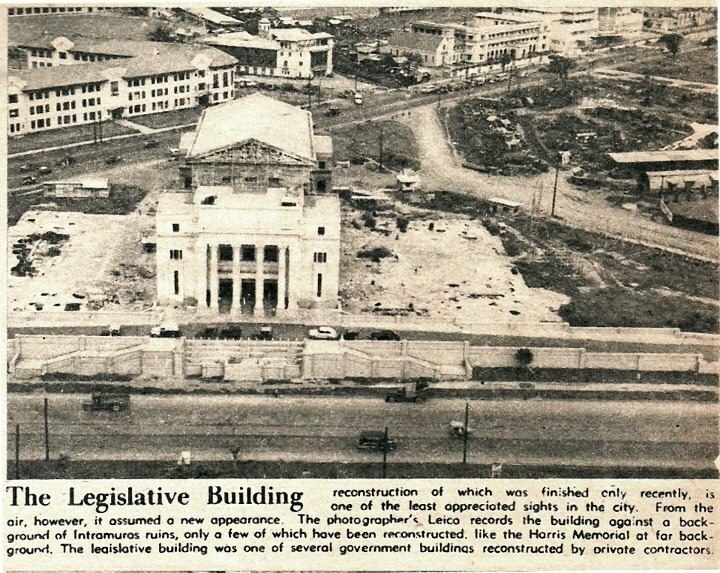 The Legislative Building was inaugurated on July 16, 1926 and cost P4,000,000 to build. Session hall of the House of Representatives. Juan Luna's Spoliarium is presently housed in this room. 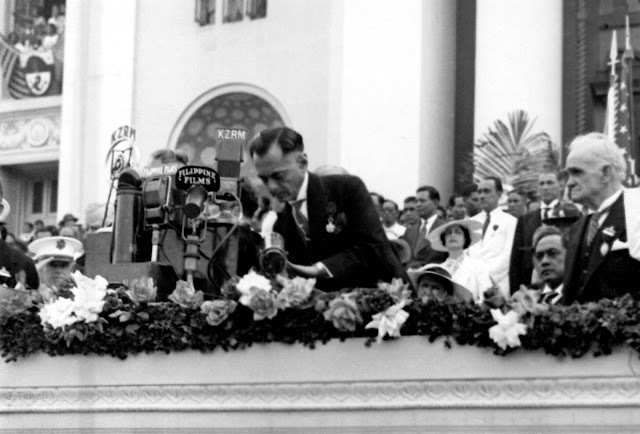 "President Quezon Addresses the Second Session of the National Assembly, October 18, 1937." 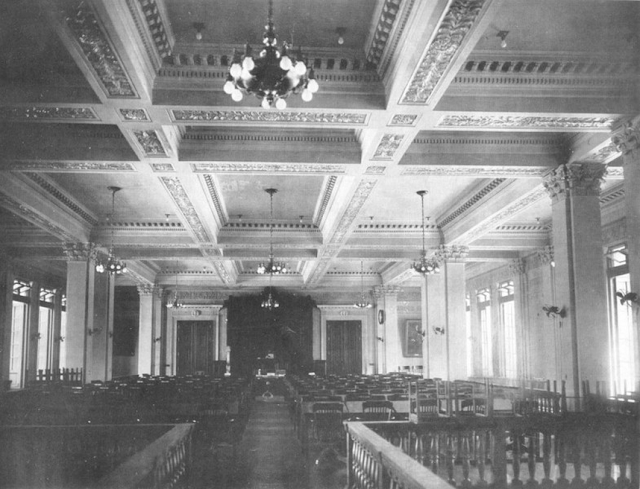 Session hall of the Senate. 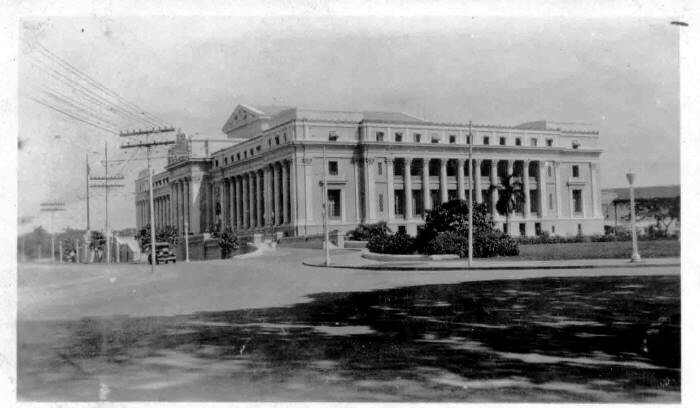 The ground floor was occupied by the National Library (1928-1944) while the second, third and fourth floors were occupied by the Senate and the House of Representatives. 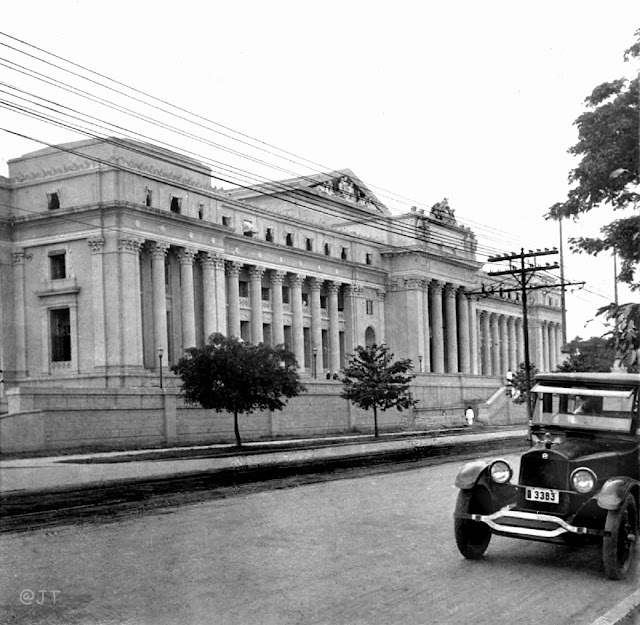 1927, front view along Padre Burgos Drive. The beautiful, ornate front portico. Another view of the front facade showing the embellishments. 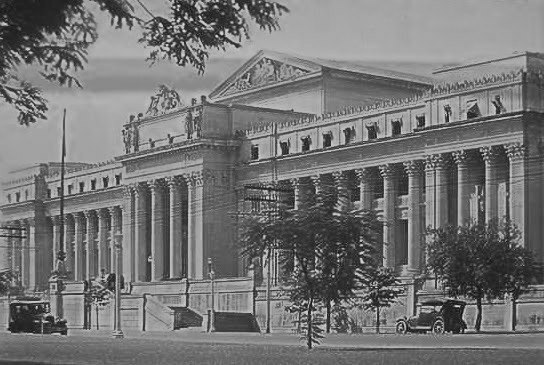 Corinthian columns and pilasters adorn the building. Colored version of the photo above. 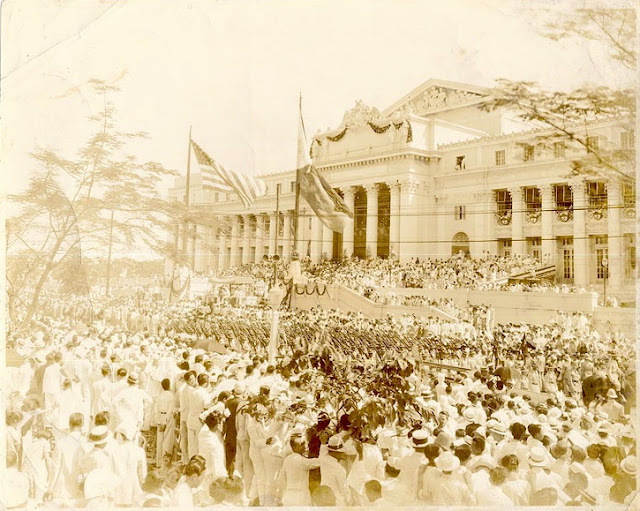 Quezon's inauguration, Nov. 15, 1935. 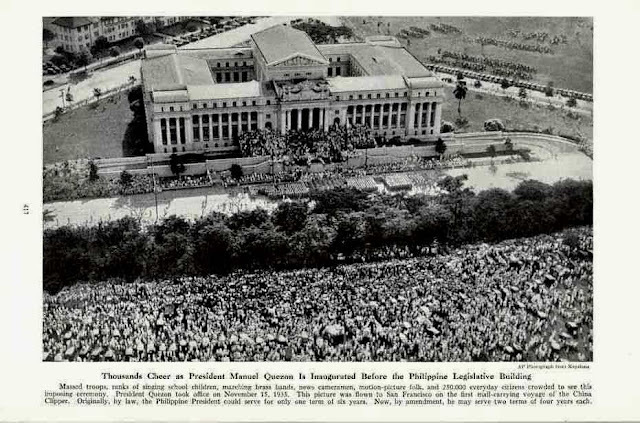 Crowds flocked in front of the Legislative Building for Quezon's inauguration, 1935. 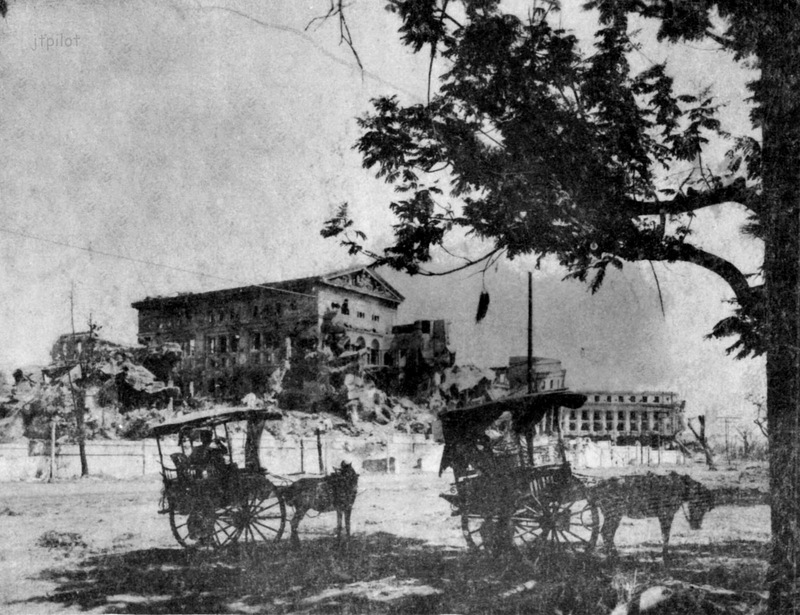 The Legislative Building served as a backdrop for many festivities before the war. 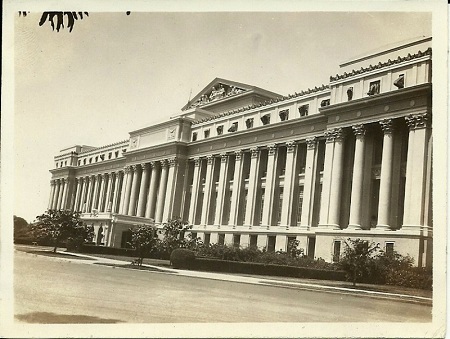 "Legislatura Building, Manila, P.I." 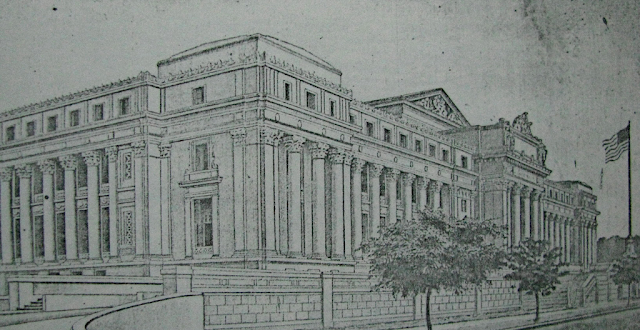 Dated 1929. 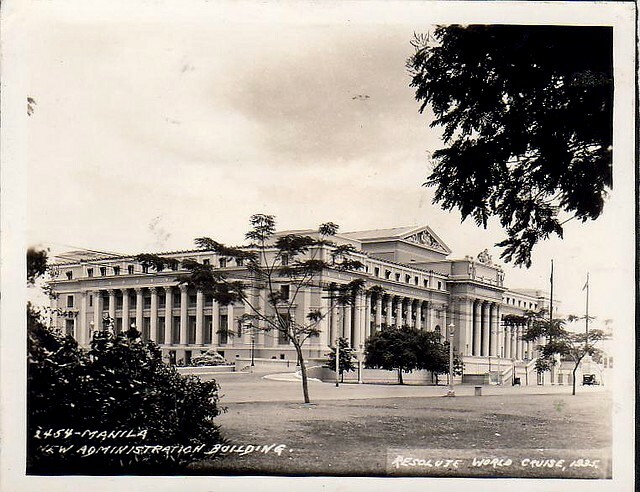 This building was also a witness to one of the highlights of Philippine history, the inauguration of Pres. Manuel L. Quezon as president of the Commonwealth. 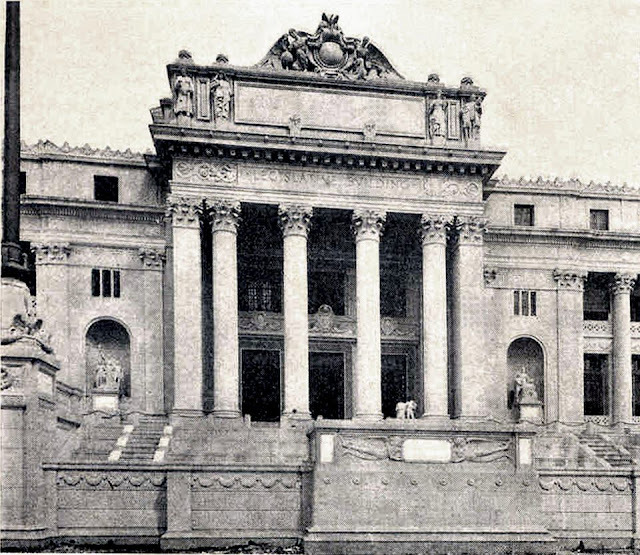 He was sworn on the steps in front of this building in November 1935. The Constituional Convention of 1934 was also held in this building. 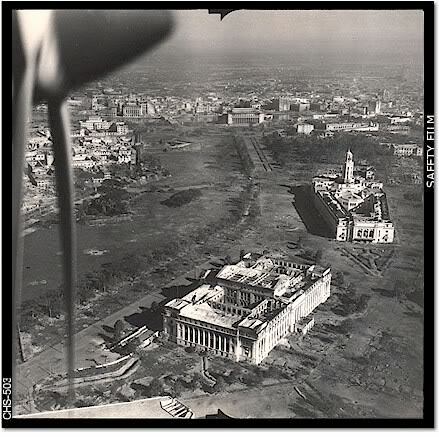 Taken from the air before February 1945. 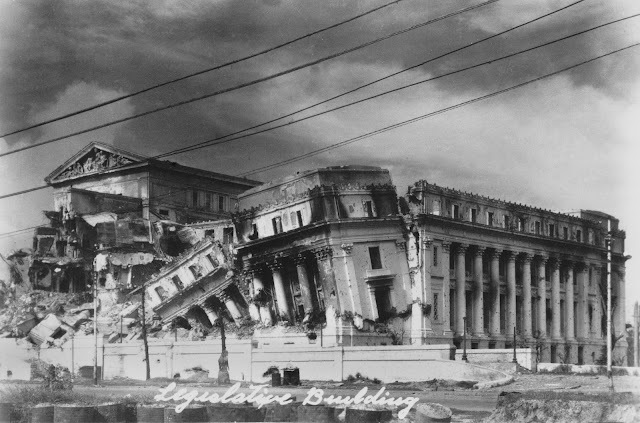 Much of the Legislative Building was still standing. 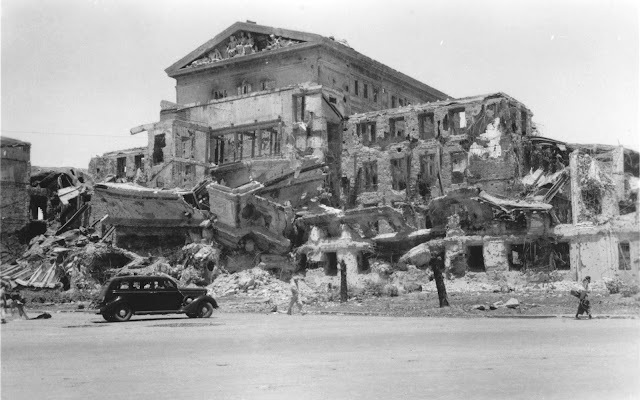 Like many other buildings in Manila, the Legislative Building was not spared from heavy shelling and bombing. 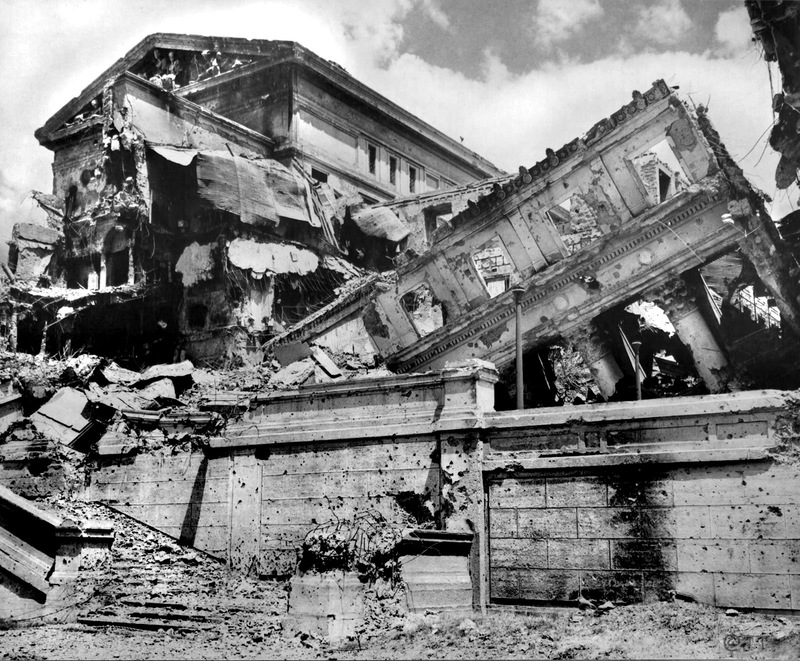 The building's central portion with the pediment still stood. Daily life continued after the war. 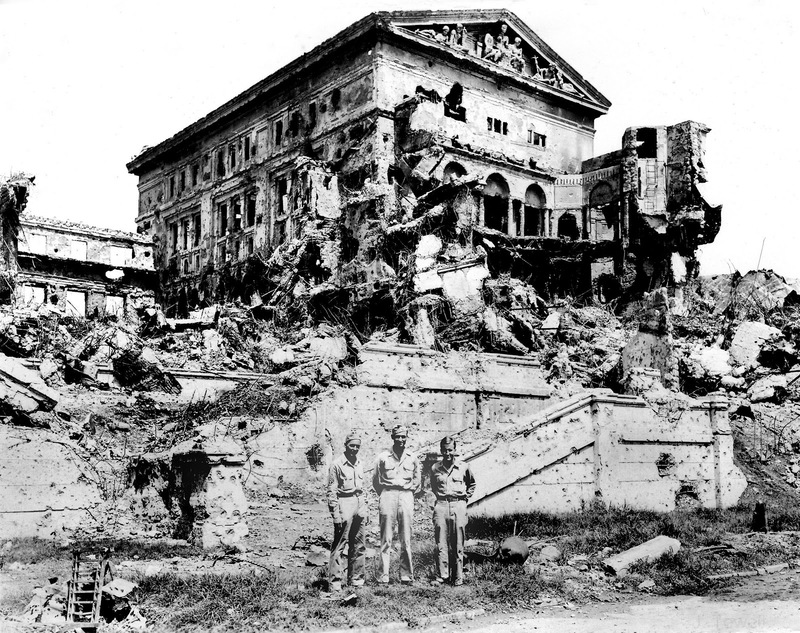 American officers pose in front of the ruined building. The damaged Legislative Building alongside the also damaged Manila City Hall in the background. This very dramatic photo of the Legislative Building captured how chaotic Manila had become. 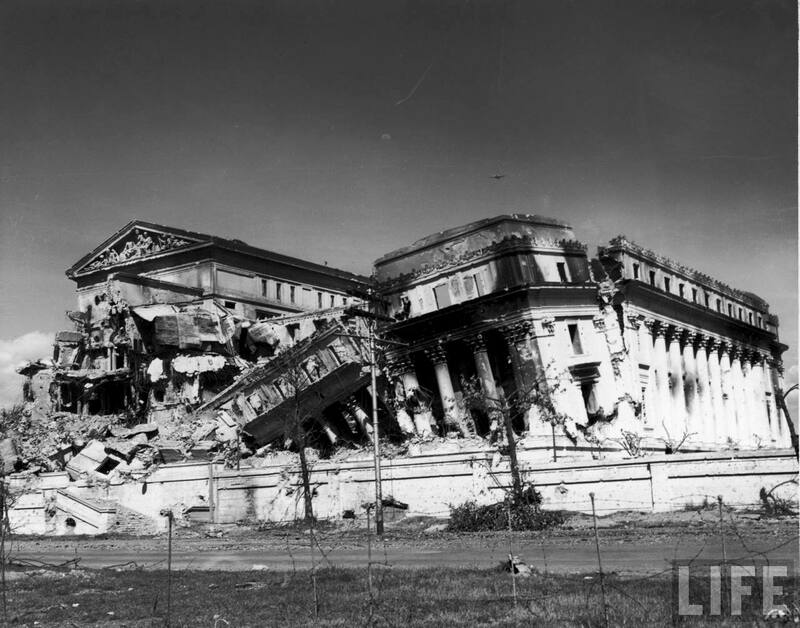 The Legislative Building was another casualty of World War II. 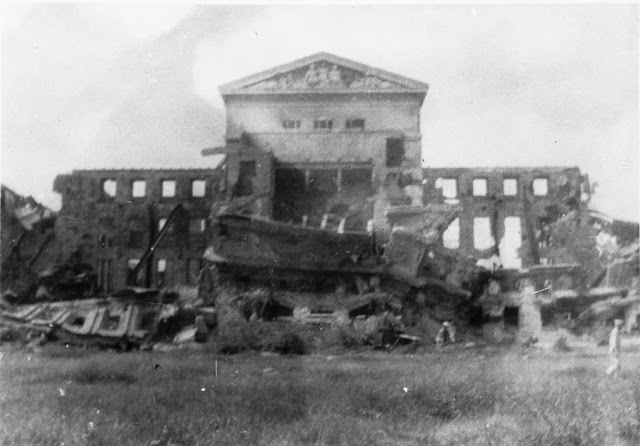 During the last moments of the war, the Japanese Imperial Army made the building their headquarters. 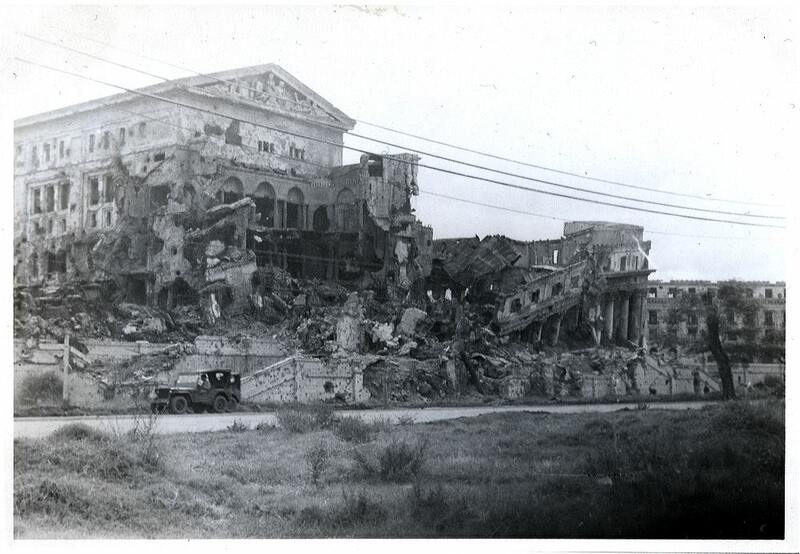 Japanese bombs and American shelling destroyed and damaged the building beyond repair. 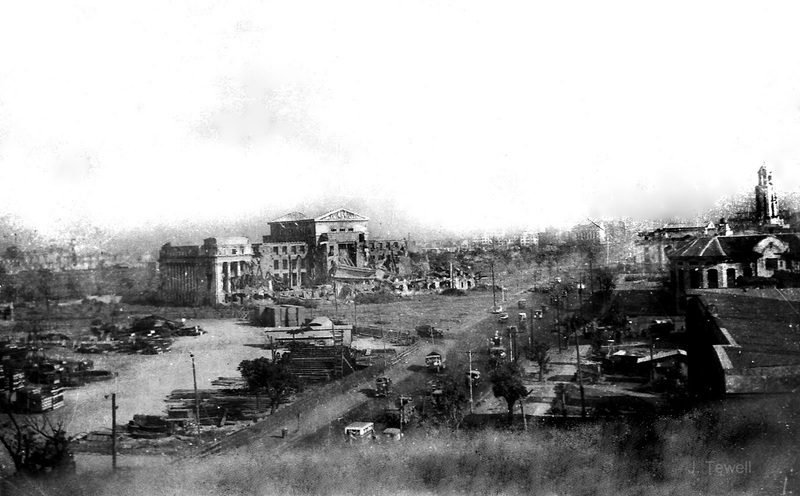 Only the central portion stood but was still severely damaged. 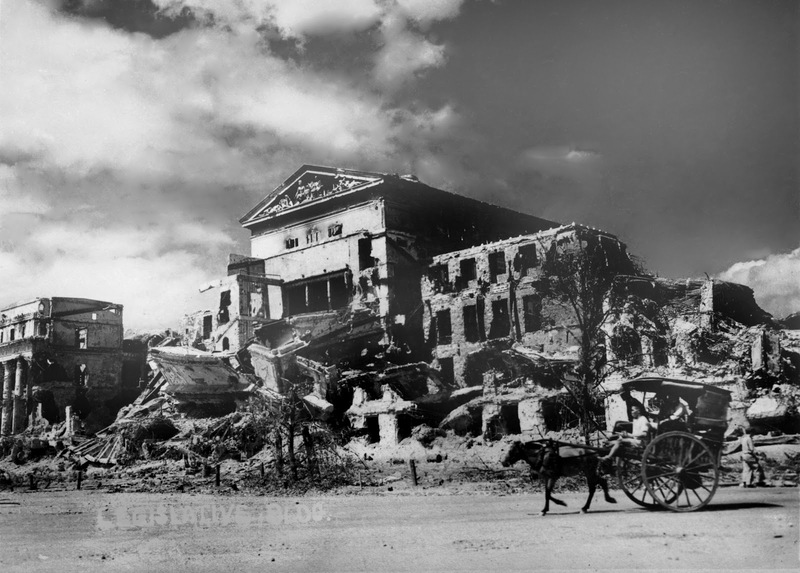 The once glorious symbol of Philippine development and progress was now turned into rubble because of the ravages of war. 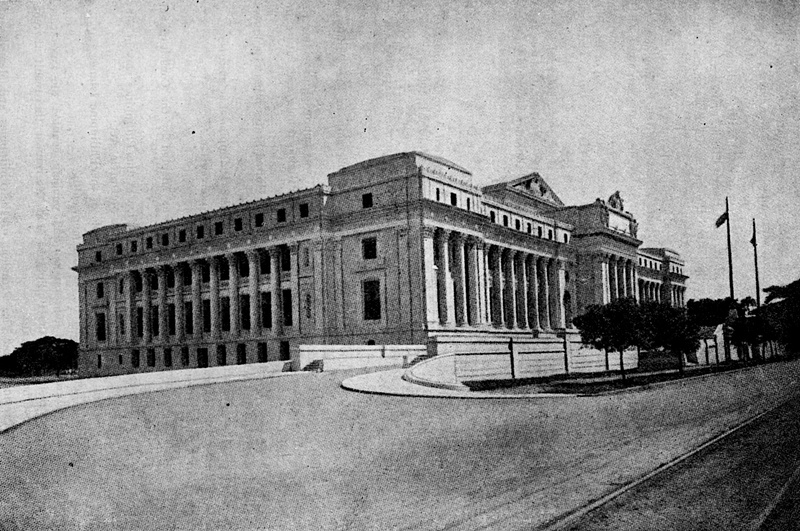 The newer version of the Legislative Building was more refined. The ornate embellishments were nowhere to be found. 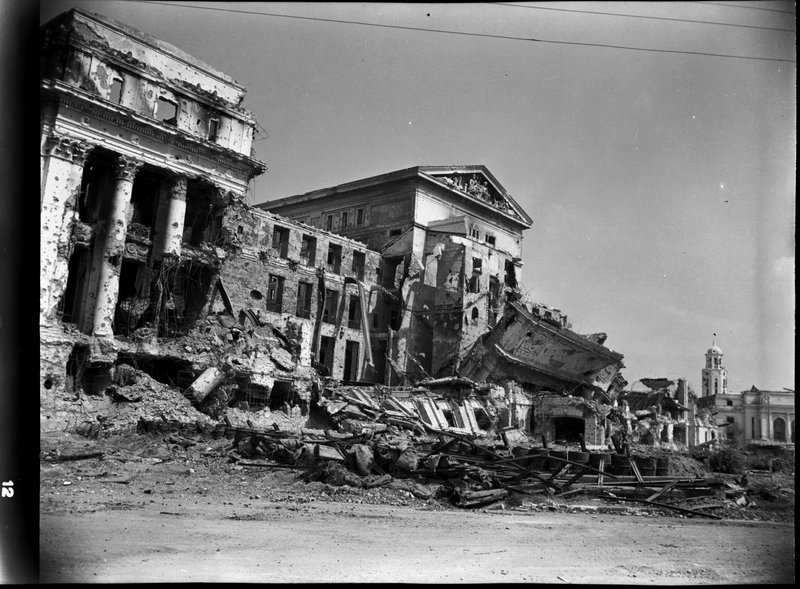 Reconstruction began in 1949 was completed in 1950. 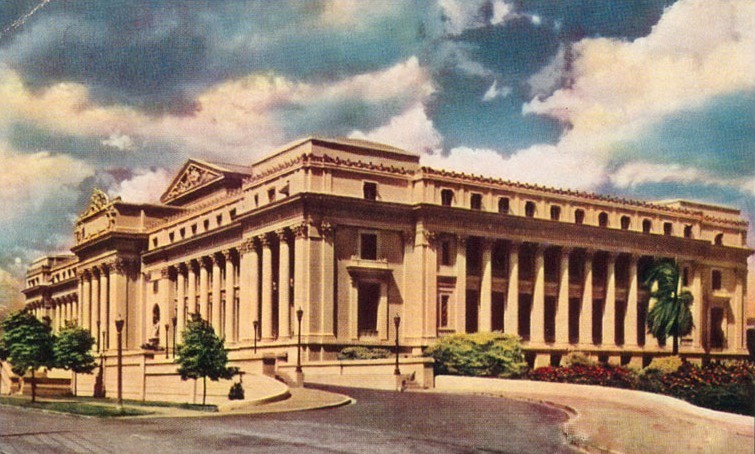 Congress moved in and the building was formally known as the Congress Building. The post-war structure did not follow the original plans. The full, engaged columns surrounding the exterior were replaced by pilasters. 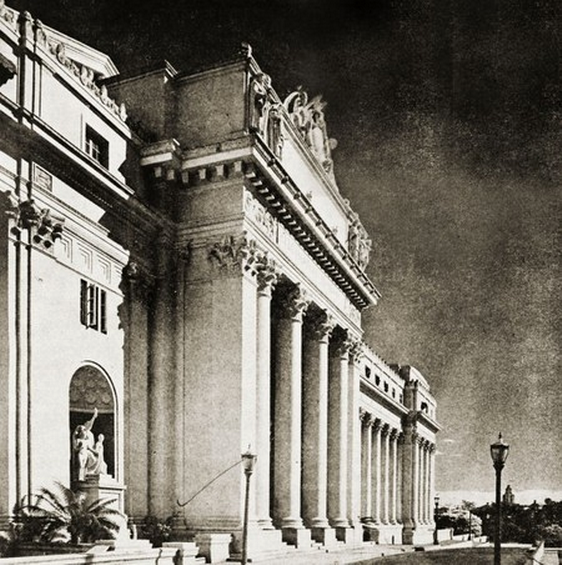 The ornate embellishments in the front portico weren't included anymore. It was a more refined version of the original design. 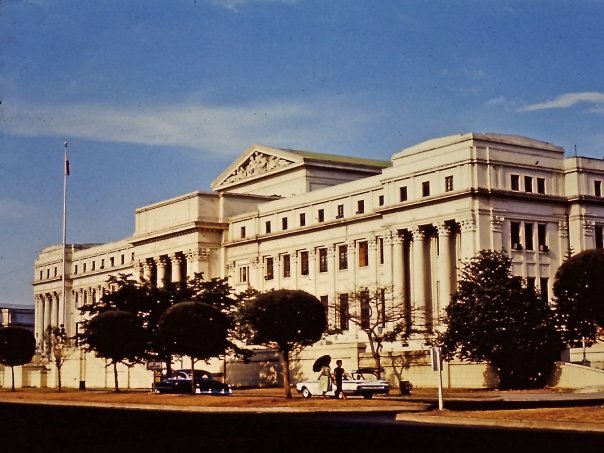 By this time, this building was formally called the Congress Building, 1968-1969. The post-war version was still beautiful but it definitely looked flat compared to the pre-war version. 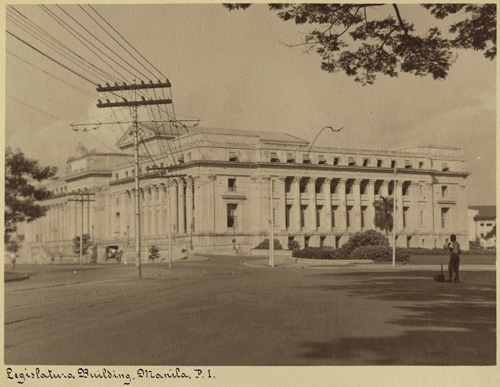 When I was really young, seeing this building at the back of the P50 bill tickled my curiosity. It still had that commanding presence and it was definitely something that turned heads. The first time I visited this building, I was completely in awe and I fell in love with it. I had no idea that the pre-war version of this building looked any different. When I saw the pre-war version, the feeling of "what a waste" ran in my mind. The original pre-war version was, without a doubt, more beautiful. 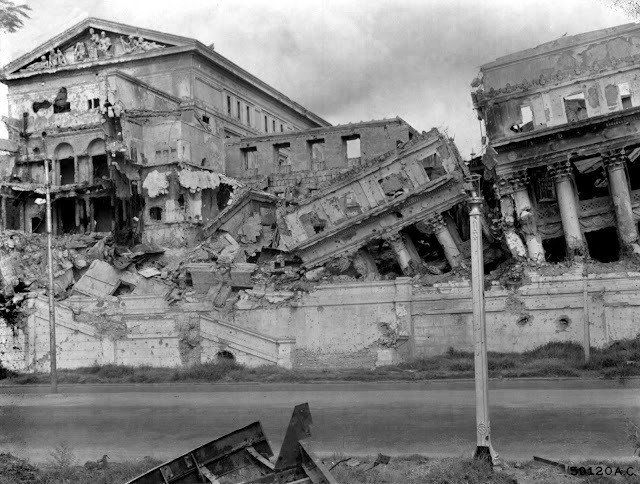 But considering the time it was built, the refined version seemed timely for a nation recovering from war. I've grown to fall in love with it all over again, even more with a better paint color. Hehe. The back of the 1949-1966 English Series 200-Piso note featuring the pre-war Legislative Building. Back of a 50-peso banknote commemorating Pres. Osmena's 100th birthday in 1978. 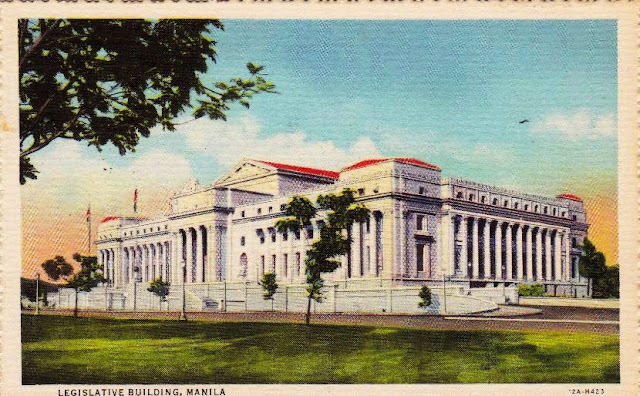 The Legislative Building was known as the "Gusaling Batasan". Everyone's familiar with this version of the 50-peso bill. 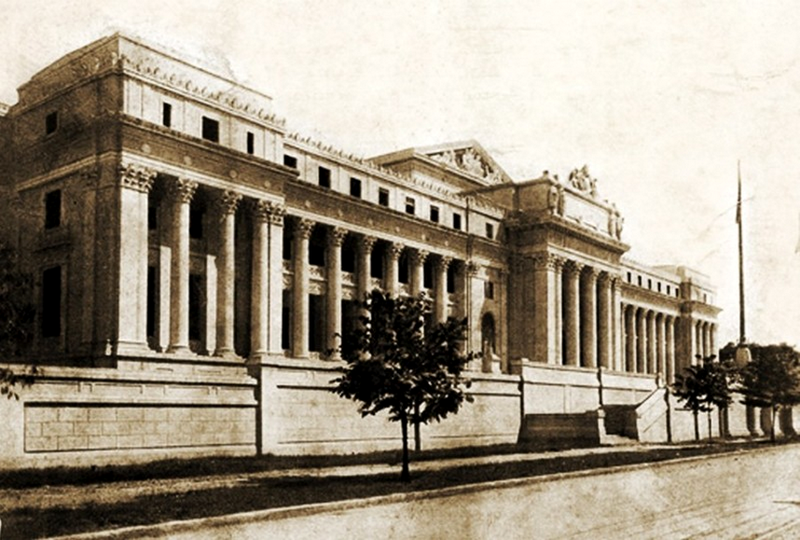 By the time this bill was released, the building was already turned over to the National Museum. 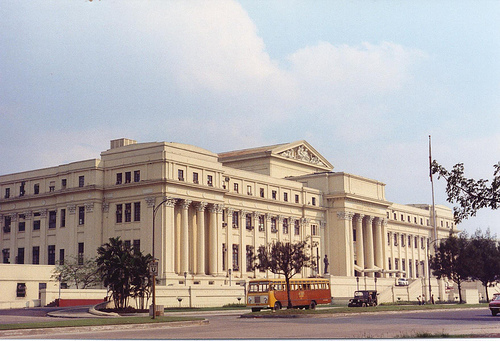 The Congress occupied the building till 1972, when Martial Law was declared. 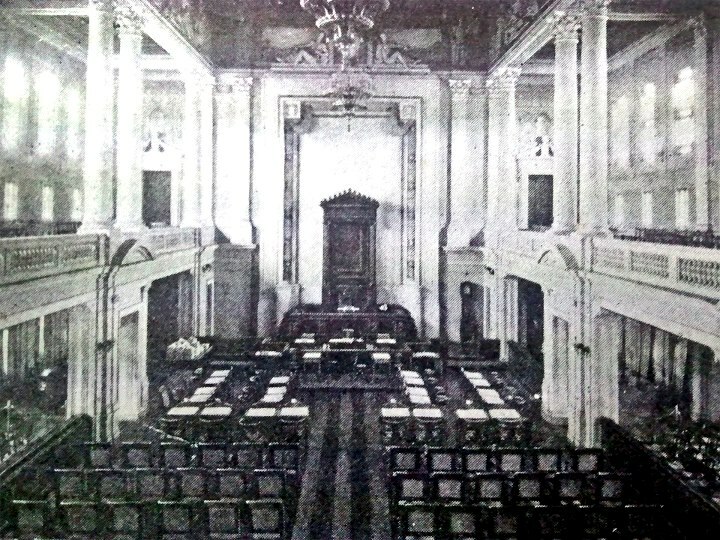 The Congress was abolished and the building became the Executive House, the office of the Prime Minister. 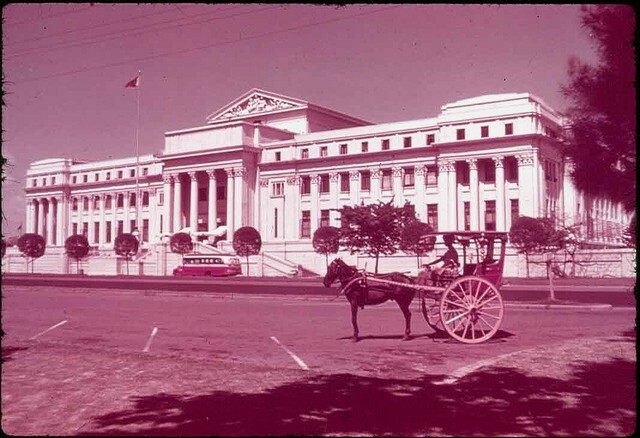 The Sandiganbayan and the Office of the Ombudsman also housed their offices there for a time. 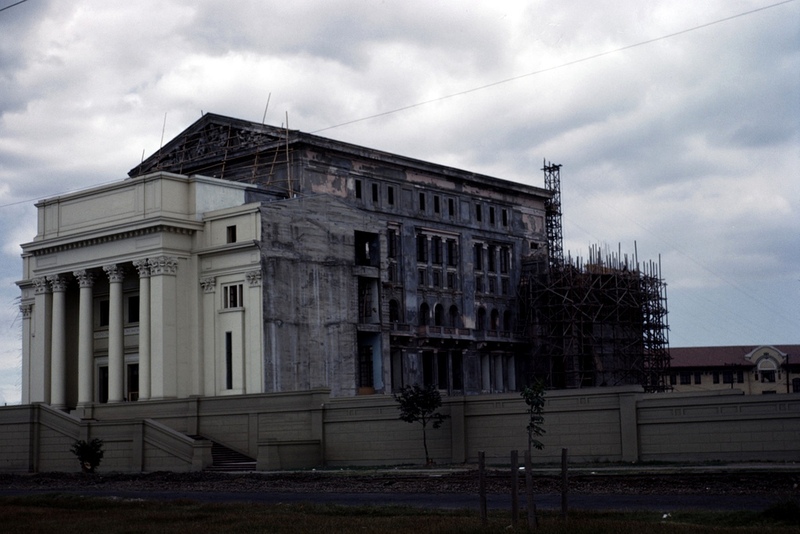 When the Congress of the Philippines was reestablished in 1987, the House of Representatives moved to the Batasan Complex in Quezon City and the Senate continued to occupy the building until 1997, when the Senate moved to its new home in the GSIS Building in Pasay. 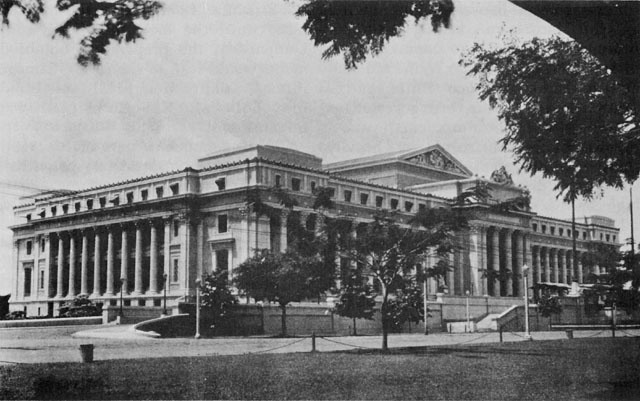 It was turned over to the National Museum and it now houses the National Art Gallery. 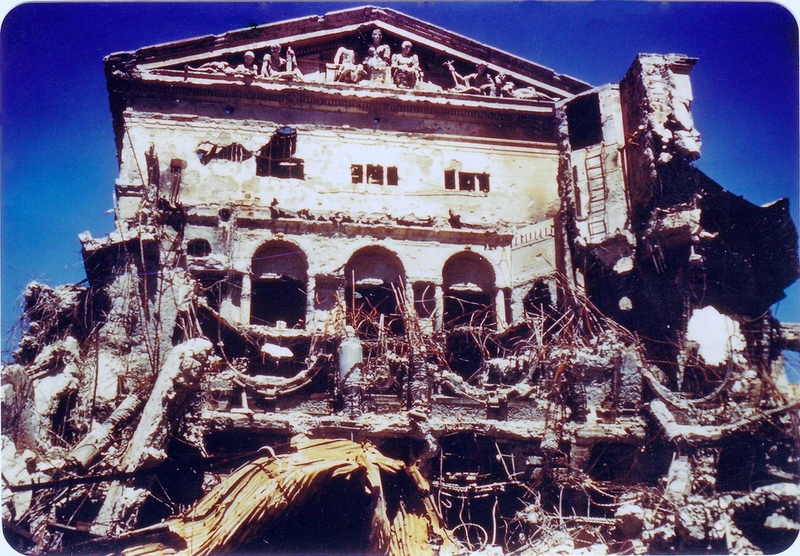 National Treasures such as the Spoliarium (housed in the old House of Representatives session hall) and many other works of Filipino artists. The museum is undergoing renovations and I am excited to visit once again. I am particularly excited for the newly renovated Senate Hall! "On September 30, 2010, the National Historical Commission of the Philippines declared the building as a "National Historical Landmark" by virtue of Resolution No. 8 (dated September 30, 2010). A marker commemorating the declaration was unveiled on October 29, 2010." Wow. such a wonderful post. I'm in awe. 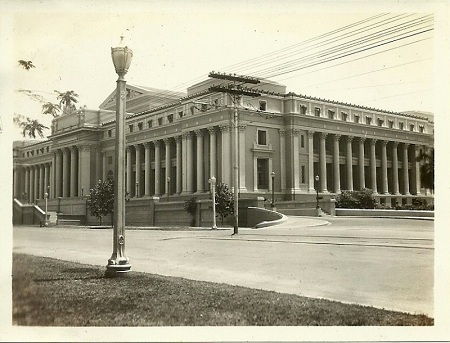 It was sad that the building was not restored to its former glory. 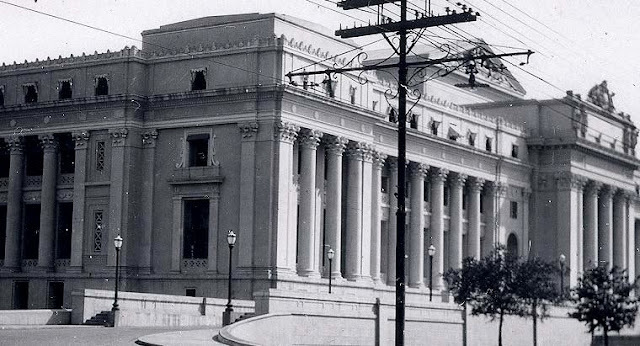 The columns that defined its grandeur design wasn't incorporated properly. 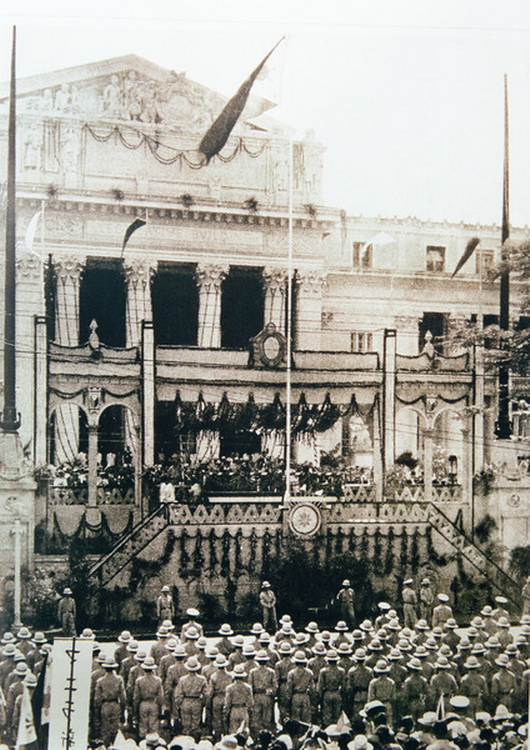 "The Legislative Building served as a backdrop for many festivities before the war." But I clearly see a banner with Japanese characters on reverse. Reversing it reads "マニラ" (manira). Katakana for Manila. So clearly this was during the Second Republic already. According to Wikipedia, during the Second Republic, Leon Guinto (former Labor Secretary of the Commonwealth) was Mayor of Manila until Liberation. So I'm guessing the banner's "マニラ新[...]" (Manira Shin[...]) stands for "District of Bagum/Bagong[...], Manila"